24 July 2017, at 6:00a.m. 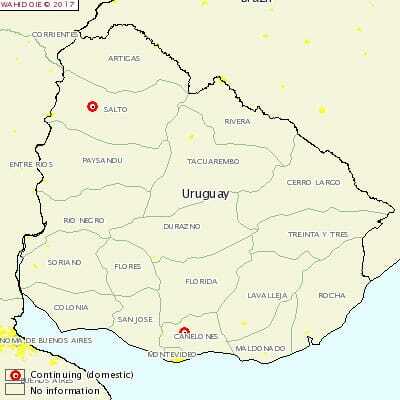 URUGUAY - The country's veterinary authorities have reported two outbreaks of porcine reproductive and respiratory syndrome (PRRS) at two pig farms, one based in Salto and the other in Canelones. An immediate notification was sent to the World Organisation for Animal Health (OIE) on 20 July. The reports states the presence of the PRRS virus was initially suspected on 12 May and confirmed on the same date after a real-time PCR test was carried out at the Faculty of Sciences, a private laboratory. A total of 12 pigs (from both farms) were found to be affected by the virus. No deaths have been reported. According to the OIE, in the framework of the academic investigation about porcine viruses performed by the Faculty of Sciences of the University of the Republic, animals testing positive to the porcine reproductive and respiratory syndrome were detected through indirect ELISA test and RT-PCR. The affected premises are located in the departments of Salto and Canelones. An epidemiological investigation has started in the affected premises, as well as in pig farms that imported breeding pigs in the last ten years. Sampling will continue in slaughterhouses. Official services summoned liberal veterinarians to tell them what the situation is and to form a working team. Samples are being analysed in the DILAVE official laboratory through serology and PCR. In case of positive results, the samples will be sent to an OIE reference laboratory. Some of the control measures applied include screening and vaccination has also been permitted (if a vaccine exists). However, the affected animals will not receive treatment.